SURFING: Mick Fanning says he won't be deterred from surfing or competing at the infamous J-Bay Open despite yet another close call with a shark he later called "one of natures great beauties”. 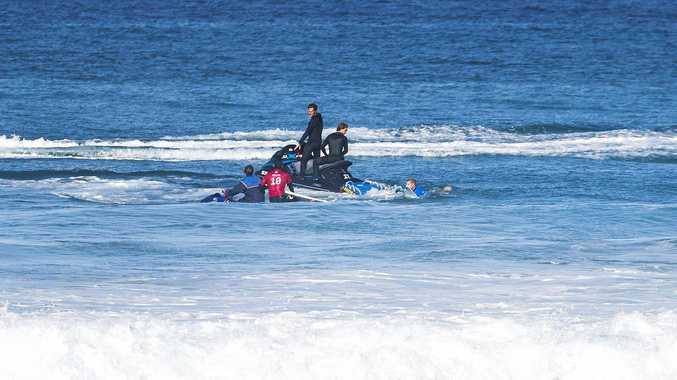 Fanning told News Corp Australia he was fine, relaxed and also "in awe” of the shark that cruised into the competition area while he was surfing his quarter-final at the world tour event in South Africa last week. Fanning said the close encounter - at the same site where he was attacked by a shark in 2015 - would not deter him from returning to the surf or the South African event he considers one of his favourites. And when asked if he was the unluckiest, or luckiest surfer to have had another close call, he laughed. "I'm a glass half full type of guy,” he said. 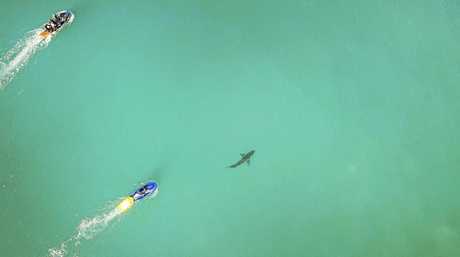 Fanning, who said after the 2015 attack that he was resigned to being known as "that shark guy” for the rest of his life, admitted he was shocked at the size of the beast lurking in the competition arena. But he also described it as beautiful. "It was a whopper. but what a beauty,” he said. "It was just so beautiful. Fanning said in hindsight the attack two years ago might have been a good thing as aerial surveillance and other protection measures have now increased on the world tour. "If that had happened three years ago we might not have even known it was in the area,” he said. "Please tell everyone I am fine. "I feel safe out there. I definitely don't want it (the event) taken off (the world tour).